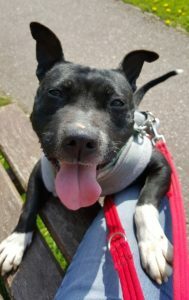 Anya is a lovely, very friendly small Staffy. She is a most delightful little girl, her tail just keeps on wagging. She would be best as the only dog in a household as she isn’t too fond of other dogs but she just loves people! 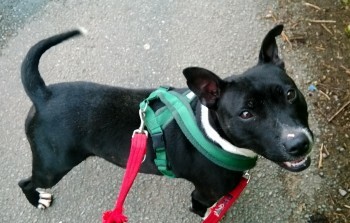 She is a happy little soul when out with her walkers but would be far happier (and so would we) if she could find her right permanent home as soon as possible- or otherwise a nice foster home. She has been with us since March 2014 which is far too long. Isn’t she adorable! She travels lovely in the car with you and is a really good girl when visiting people in their homes on days out, She so deserves a lovely home of her own. Wonderful news, Anya finally found her forever home in January and has settled in really well, we are so pleased for her!